Once the surgeon removes the cataract, a new lens is needed to replace it so the patient is able to see. 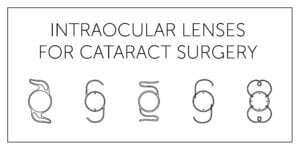 The intraocular lens, or IOL, replaces the natural lens that was taken out during the cataract surgery by being implanted within the eye. The standard Medicare approved lens implant is the monofocal. It allows the patient to only see one kind of distance, usually distance vision compared to near, requiring them to wear glasses after their surgery for near distance activities. At Kerrville Eye Center, we offer premium implant options. Even though Medicare only partially covers these IOLs and will require some out-of-pocket expense, these implant options allow patients to enjoy a greater range of vision. These patients are able to leave our office, free of glasses or bifocals. Multifocal IOLs allow patients to have good vision at both near and far distances. These IOLs have different levels of power and each power diffracts light differently, reducing the need for reading glasses or bifocals. These lenses include ReStor by Alcon & Tecnis Multifocal by AMO. Toric IOLs are implanted in the eye if the patient needs to correct astigmatism, which is when light can’t be focused to one point on the retina due to the asymmetric steepening of the cornea. If not corrected, the astigmatism can cause blurry or shadowed vision. Toric IOLs may be your best chance at freedom from glasses after surgery if you’re a cataract patient who also has astigmatism. Accommodating IOLs were created to mimic the eye’s natural lens. The lens is created like a hinge, allowing it to move using the ciliary muscles inside the eye. This permits the lens to move and flex as the natural lens would have to focus on a single point in the range of distances. These lenses include Crystalens by Bausch and Lomb.